You also might notice that Cocoa and Sabrina were NOT on the same team. Even if BRA were deep enough in talent, it’s wishful thinking that friends wouldn’t face each other in the ring sooner or later. What do you guys make of Sabrina’s licensing/modeling career so far? 😛 And can anyone figure out all of the characters Sabrina is dressed up as? Black Widow vs Kaci The Huntress! Vote to see what’s coming up on Wednesday between these two! Well Magik, Aayla Secura, and Jem are the easy ones. I’m sure I know the outfit in Panel 5. Tip of the tongue, so to speak. I suppose I should add Panel 1, where I can’t get a lot of detail to the outfit on the screen but my guess is she’s doing The Bride from Kill Bill. 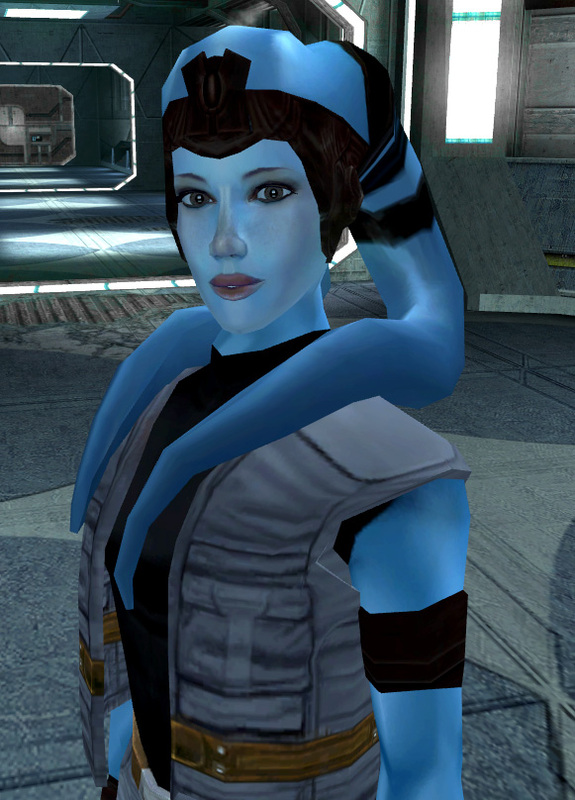 She could be Aayla, but I actually thought she looked more like Mission Vao from the first Knights Of The Old Republic. Right you all are, and great pick with Mission, Rob, but I went with Aayla on that. Also, great catch with Bea the Bride in panel 1! I GUESS Sabrina VS Sayuki.. Sayuki won? since this is a time warp? and moved by Damage Inc on Sabrina? I mean Syndicate move on Sabrina? Does anyone think that Neko beat Sabrina in their rematch? Notice the look on Sabrina’s face…she’s not losing that match. Time warp is needed to progress the story. I could’ve easily spent a few months on these matches but the story has to come first. I want to ask Snowkitten this..
Sabrina knocked Neko suki out twice.. Unlikely. If anything, the Catgirls should probably be angry at Neko for failing to uphold kitty standards. Cats are not pack animal so no I would not go after Sabrina because of the fight. However if we fought I would make her think I was gunning for her because of her evil ways. You know, get in her head. Am I the only one who recognizes Saturn Girl? (the “I know what you’re thinking” is a dead giveaway.) Also, how did those matches come out? I recognized her too, although usually when I’ve seen her, her costume has had pants. Mind you, the only Legion stories I’ve read have been during Mark Waid’s first run on the book, so she might have worn the costume here at some other point. Jim from FAWN mentioned that he would try to write the tag match and if he does, I’ll see if he wants to put it up on the forum. The Neko/Sabrina match probably shouldn’t be too big a mystery. 😉 And for Sayuki vs Sabrina…I leave it to you though I must say that I think that Sayuki has more experience, Sabrina has more skill/talent. Well, I’d make a guess, but as others already have and I agree with them, it’d be redundant. I say Sabrina won… most of her matches. Yeah. Yeah, every bit as tasteless and exploitative as I assumed it would be. Freaking Japan. Though it IS kind of interesting that she’s doing American movies, cartoons, and comics, rather than, say, manga characters, which I figure would be more relevant to the target audience. Guys, the “how did the matches come out” is explicitly “up to us” – not important to the story, and won’t be officially specified. Except for the Neko match, apparently, because Neko’s just not going to win. Nice layout boss. Cute take on the 80s movie montage. And I do hope you don’t spoil the FAWN match results, after all it would self-serving or hurtful to those involved if you did. ‘Brina win alla those matches! I have decided and so it is true! OH! And can we do a photo shoot? Please!! That’s not so. You have lovely hair. Great highlights, thick a soft. Suits you very nicely. These two pixies? Even if it was a triple threat match, it’d be a handicap match, partly because they’d naturally go after the greater threat, and partly because they’d be handicapped by each other. Everything’s always about food with you, Rua. Lots of teasing and few answers. Haha Too funny! And too true! I found this page rather confusing as I’m pretty sure I do understand the point that its supposed to be moving time forward but it looks like doing so we lost three matches of Sabrina’s BRA career in the process. And normally the outcomes of her matches move the story forward. I’m really confused as to what this is leading to with the sudden warp in time. I have to imagine we have missed out on quite a bit of important moments in Sabrina’s life. i think it makes sense. The big bad here inthis season is Black Widow. If we go through all three matches here then it’s months of RL time before we get any closer to BW vs. Brina. Plus it avoids the season 1 thing where it seemed like Brina only had 5 matches the entire time berfore she’s main eventing Heaven and hell <cough> co-main eventing- sorry champ. The Cocoa match was given some length because Brina needed a friend out here so we got a good look at Cocoa to introduce her into the picture. at least this way we see Brina running across extra people (so if they turn up later for whatever reason they have a reason behind it). now i expect the Kaci/BW match to be given some time as BW can “take care of brina’s protector” so brina will have “no one to hide behind” anymore. note: Kaci has in no way aggreed to being in such a role for Brina. sorry gotta go with “co”. Chloe-in Paris- cage -i quit- feud ending match. anywhere else and sure. but not under that stellar alignment. Yeah, that actually bugged me about Season 1 where Sabrina didn’t have very many matches at all. In the greater scheme of things, it was more important for me to move the story forward than to spend the next few months on these matches and I don’ tmind telling you that I truly would have LOVED to that. Showing Sabrina squash someone else for a change, have to fight her new buddy Cocoa in a tag match AND have to find a dangerous bombshell. Plus, there’s a few more pages of accelerated time as well, but it’s all for a very good reason. I liked the page. It’s good to see that things are busy, and to see all the… errrrr…. characters – yeah, characters – in Brina’s world. It different enough from RA to be a bit exotic for her. It’s fun to see BW at work. That looks like a train wreck for sure. I can only hope our little friend has the sense to duck. I saw BRAVE and it was fantastic. 🙂 Sabrina could’ve nailed it. Oh yeah…Black Widow will be making almost as many appearances as Sabrina. !! I second that? Is FAWN still active? I was going to join, but they’re not accepting new applications. You don’t have to join to read the matches. It’s a e-fed where most of the matches results are discussed ahead of time and then the talented writers take over. Most of the writers have 2-8 wrestlers that they write for. If you want to be a writer, I’m sure they’d love to have you or maybe just love to have your adorable self there. bah it’s not autofilling my name again. i think Brina wins the first two but might have lost the last match. Cocoa doesn;t take the fall though in her team’s loss. This next one will be a tough one for Brina- does she root for Kaci or BW? somehow i think a Brina save to grudgingly get some respect from Kaci being in the endgame there. I recently installed a plug-in that is supposed to help the site load faster. I hope it’s not the reason for the non-autofill. Lookit at you trying to read into the foreshadowing here between Magick and Aayla. 😉 That’s some good predicting there for the matches and I won’t contradict it a bit. If Jim from FAWN writes the tag match, I’ll see about getting it in the forum or a link to their site. I’d like to see Bitsy’s backstory. Me too! I really wanted to do Chloe’s backstory too but I just didn’t have the time. I think Bitsy’s might go the same way. What I’m wondering is why Sun hasn’t called yet. (Or, if she has, why it’s happened off-panel.) I mean, she’s had all this time, and she’s obviously keeping track of what’s going on with Sabrina since she used her pull in Damage Inc. to help her, but no return calls or texts or anything? Give me Sun or give me death! So Sabby’s modeling for Japanese products? Some of their celebrity commercials are INSANE. LOL, I know!! I wanted to get into it some more, but alas, time was not permitting. I smell a backup story, or bonus content for the next GN collection. I think we all know who won our match. You should be happy the whole messy affair was truncated. SO SAYUKI WON AGAINST SABRINA!! That’s right! Never. But won’t it be fun to try! 😀 HAJIME! Ummm…maybe. I mean yes. Definitely I would. But I’m booked for awhile, so, ummm…I’ll get back to you. To be honest, I like to see that match. lol Since I look into her profile and she looks to be a Japanese version of Katherine Smith with being a Brawler/Powerhouse. By the way, what is the Reverse Breast Smother, also known as “The Setting Suns”. I know the frontal version and normal one (Daffney did it Mickie Knuckles in a indi match) But never heard of a Reverse one. Love this page, Sabrina is fantastic, Love the ones she posed as Saturn Girl.